I’ve never been on a writing retreat. I mean, when I retired three and a half years ago, I figured the rest of my life would be one, long writing retreat, but life intervenes. Yes, I’ve been extremely productive in that time, but one thing or another threw up speed bumps along my writing journey. So, I watched vicariously on Facebook as author friend after author friend went to writing or artist retreats. I studied the possibilities in Poets&Writers Magazine, but I still wondered if that was for me. I need contact with human beings. Shut me up in a writer’s garret somewhere and leave me to my own devices, and I’ll give stir crazy a bad name. Still, on this journey to publication, I want to give everything writerly a try, so I signed up to go to a week-long retreat at a place recommended by Mel Walsh Jones–The Porches. The Porches is the kind of house I grew up in–antebellum, quirky, and with character. I loved it the minute I saw it–minus the shrieking cicadas and the ubiquitous stink bugs. The whole house and the writers rooms are charmingly eclectic with wonderful artwork, intriguing knickknacks, and an amazing collection of books. It is, literally, in the middle of nowhere in Nelson County, Virginia, surrounded by hills and trees. The web page says “on the James River,” but “near” it might be more accurate. However, the foliage is thick enough the James could be out the back door but you couldn’t see it. It is incredibly quiet (even the trains seem subdued) and incredibly inspiring. Take a look at the web site (link above), and see how Trudy Hale started this place, and you’ll be tempted. Give in to the temptation because it’s also incredibly affordable. Though you do bring and cook your own food–which I like–the nightly cost is well less than a stay at a decent hotel, and the more writers in the house, the price goes down. And it’s not necessarily for locals. In addition to me and a writer friend from the Richmond area, there was a poet from Iowa and a novelist from Alaska! “Quiet time” for writing reigns from early morning until about 1730, when writers gather in the kitchen to make dinner or in the parlor to watch DVDs–and to talk writing in both places. Most often after those evening get-togethers, we go back to our rooms and write some more. 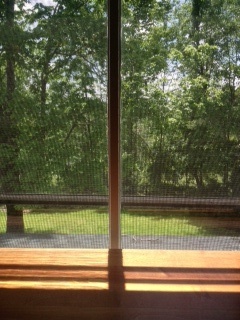 The view from the window of my room at The Porches. And that quiet time goes fast. In five days and four nights here, I did a read-through of a novel rough draft to identify the plot holes. Got that done on the first day. I worked on the draft of a short story for a contest–editing it from 1,600 words down to the required 1,200 words–and submitted it. I drafted three completely new short stories, between 2,000 and 3,500 words each, as well as several new scenes for the novel, not to mention editing the first twenty pages of it so that was in good enough shape to submit to the workshop I’m going to attend at Tinker Mountain. The down side? Well, as I said, you are in the middle of nowhere–a half hour to the nearest grocery store–and I was concerned about how long it would take an ambulance to get here if needed (not to mention navigating the narrow road and driveway). Yes, when you get to be my age, you focus on such things. By Thursday when someone needed a ride to Charlottesville to catch transportation to DC, I jumped to volunteer for the drive. I needed to be around people. The quiet time rules are pretty inviolate, and I missed being able to go knock on someone’s door just to chat or bounce ideas off. I had also thought we’d do some readings of our work, but that didn’t come together, because, as I said, after dinner we often went back to writing. Also, though The Porches has Internet, it is satellite Internet with a minutes limit. Twice we exceeded it and lost Internet access just when I wanted to research, say, condoms in World War II. I think that’s something that needs to be addressed to make a stay here close to perfect. Yes, social media can be distracting, but when you write fiction, which draws a great deal from history, as I do, you need Internet access to research. And, yes, I know such things can wait until I’m back home with my high-speed Wi-Fi, but sometimes when you get the need to know something and can’t get to it, that is just as much a distraction. Would I do it again? Yes, probably in the fall, because the foliage would be incredible and the humidity way less. It was an incredibly productive week for me, and I accomplished much more than I expected. Going to The Porches was an excellent investment in advancing the publishing journey. Since writing is an essential part of a writing retreat, I had no option but to write for Friday Fictioneers–especially with such a nostalgic photo as we got this week. I’ll be blogging next week on the writer’s retreat, so I won’t go into much detail here, except to say–a whole lot of writing is getting done! Today’s story is “Priorities,” and if you don’t see the link on the title, scroll to the top of the page, click on the Friday Fictioneers tab, and select it from the drop-down list. And don’t forget to check out the two book selling/signing events I’ll be doing the next couple of weeks–see details in the top of the righthand column. 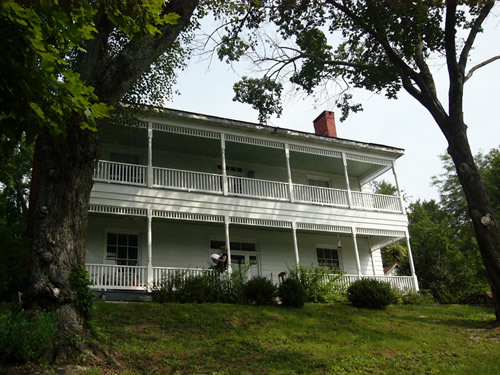 This week I’ll be at The Porches in rural, central Virginia at a writing retreat put on by one of my writer friends, Mel Walsh Jones. Since it’s my first writing retreat, I’m not sure what to expect, but I’m hoping I get a lot of editing and revising done on the rough draft I completed for last year’s National Novel Writing Month. Mainly, I’m looking forward to getting away from all the distractions my house and home town can offer and communing with other writers and perhaps a bit with nature. So, a short post today, and I’ll write more about how the retreat went next week, after I return.